That the Church of Rome is not the head of all churches more than any other church is; nor that Peter had any more powers given of Christ than any other apostle had. That the Pope of Rome hath no more in the keys of the church, than hath any other within the order of priesthood. If any temporal Lord do know the church so offending, he is bound under pain of damnation, to take the temporalities from the same. That the gospel is a rule sufficient of itself to rule the life of every christian man here, without any other rule. That all other rules, under whose observances divers religious persons be governed, do add no more perfection to the gospel, than doth the white colour to the wall. That neither the pope, nor any other prelate of the church, ought to have prisons wherein to punish transgressors. against Wyckcliffe who again walked free while the priests were left fearing for their lives. preaching to the people at large. The bigotry of Wyckcliffe`s opponents is clearly displayed in comments passed on his translations of the Bible. “This Master John Wickliffe hath translated the Gospel out of Latin into English, which Christ had intrusted with the clergy and doctors of the Church, that they might minister it to the laity and weaker sort, according to the state of the times and the wants of men. So that by this means the Gospel is made vulgar, and laid more open to the laity, and even to women who can read, than it used to be to the most learned of the clergy and those of the best understanding! And what was before the chief gift of the clergy and doctors of the Church, is made for ever common to the laity” . Go and preach, it is the sublimest work; but imitate not the priests whom we see after the sermon sitting in the ale house, or at the gaming table, or wasting their time in hunting. After your sermon is ended , do you visit the sick, the aged, the poor, the blind and the lame, and succour them according to your ability. His “poor priests” as they became known set of barefoot, staff in hand, and clothed in a coarse robe, who lived off of alms and were satisfied with the plainest food. They frequently slept in hedgerows, graveyards and occasionally a church if admission was allowed. They were met by approving crowds who appreciated their teachings in the common tongue. Among these new preachers was John Ashton who was a very active missionary and consequently pursued by the Church unto death. council as a rebuke from God. Nearly a century and a half later, the young monk, Martin Luther, in the Augustine monastery at Erfurth, was converted by the Epistle to the Romans, and returned to the spirit of St Paul and the religion of Jesus Christ. Wyckcliffe was literally struck down by a stroke while elevating the host at a service in his parish church at Lutterworth on 29 December 1384. He died on 31 December 1384. 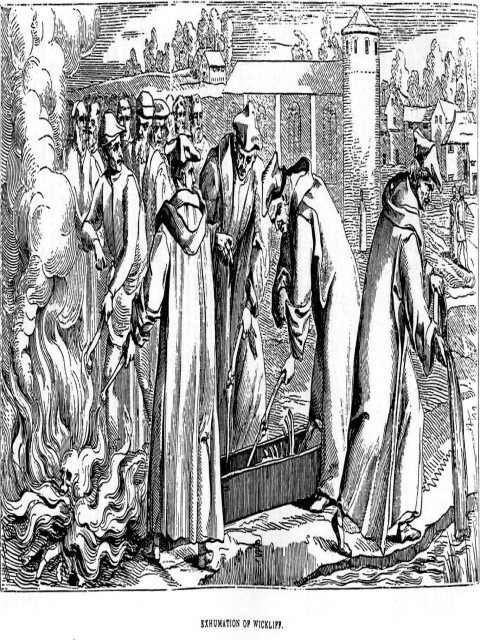 In a final act of persecution and pettiness the Church at its Council in Constance in May 1415 decreed that his body be exhumed, his bones burned and ashes cast into the river. The decree was not in fact executed until 1424 by Richard Fleming, Bishop of Lincoln, by order of the Council in Sienna. and railed against his very memory and his works. The judgment was made on the basis of some 45 selected articles or extracts from Wyckcliffe`s sermons and writings. The decree shows how powerful, and frightening to the prelates, was just the thought let alone the words of the Reformer. The works of Wyckcliffe and his doctrine was in the public domain, and even nailed on church doors (see Conclusions 1395) at least 122 years before Martin Luther posted his Theses at Wurtenberg in 1517. He thus has a claim to have initiated the Reformation in England and Europe. Luther, however, had greater support from the princes and nobility, whereas Wyckcliffe had support while his focus was the friars, priests and popes but shrank back at this time from a radical and living spirituality. But the day of Reformation was but delayed a while. The Papal Bull to Oxford University directing action against Wyckcliffe. The epistle from Pope Gregory to the king (Edward III / Richard II) to support the arrest and imprisonment of Wyckcliffe.